I’m so happy you are here for the recipe for these amazing healthy candied pecans! Before I give you this recipe though, I wanted to offer you my newest eCookbook totally for FREE! I collected 10 of my favorite clean eating dessert recipes (including a recipe for healthy Caramel Sauce and a healthy chocolate fudge to put it on!) and I just know you are going to love them! Just click HERE or on the image below and enter your email address and I’ll email you a copy. Now that you’ve requested your free eCookbook, let’s get onto the recipe for candied pecans! Here’s the deal, I love to be healthy and feel great, but I’m also a foodie. And, as a foodie, I just can’t image the holidays without my favorite holiday foods. So, don’t worry, this year I’ll be sharing healthy versions of all my favorite holiday foods … win-win! Candied Pecans are one of my favorite holiday treats, and this clean and healthy version, made with pure maple syrup and unrefined coconut oil are every bit as good at the sugary alternative! Really, you’re going to die when you try these babies … and want to hide them from the rest of your family … and eat them for breakfast, lunch and dinner! They really are that good. Oh, and here are a few of my other favorite holiday foods made healthy – Pumpkin Cake Cookies, Homemade Caramel Sauce and Pumpkin Pancakes. Enjoy! Melt coconut oil in a skillet over medium-low heat. Add maple syrup, vanilla and salt and stir well. When mixture is bubbling, add pecans. Stir pecans well, so that they're completely coated in the maple syrup mixture. Cook and stir constantly for about 5 minutes, being careful so that they don't burn. Take the pan off the heat and transfer the pecans onto a piece of wax paper or parchment paper to cool. *Actual nutrition info may vary based on exact ingredients used. Find this recipe and complete nutrition info on MyFitnessPal as FG8 Candied Pecans. 1. Nutiva Unrefined Coconut Oil: I did a lot of research on coconut oil and this Nutiva brand is a good balance between quality and price. I’ve been very happy with the quality and the flavor, but the it isn’t outrageously expensive. I buy the big tubs and they last me 4-6 months, even though I use them often. 2. Pure Maple Syrup: When we started trying to cut back on refined and processed ingredients, we switched to using honey or pure maple syrup to sweeten our treats. Just make sure you look for pure on the label – it’s definitely not the same as pancake syrup. 3. Cast Iron Skillet: I am in LOVE with my new Pioneer Woman Cast Iron Skillet. Everything just cooks better in good quality, and of course pretty cookware. You can find this gorgeous turquoise skillet on Amazon, or at Walmart. Looking for more healthy real food dessert recipes? * Some links are affiliates. The cost is the same for you, but I get a small commission. I never recommend any products that I don’t sincerely believe in. « Loco Coco 5k – Free Registration Giveaway! Question: what if there are no extras to hide in the airtight container because I CAN’T STOP EATING THEM long enough to get to that point?!! I don’t like the taste of maple syrup. Can I use honey instead? Does it acquire the same consistency to coat the pecans? And Carrie Morris, you are too funny!!!!!! You can use corn syrup. Also adding a little cayenne adds a little kick. Could you do this with walnuts or almonds also? Would you recommend sliced almonds? I followed the recipe but after cooling, they stayed sticky. Is this usual? Huh. That’s never happened to me. I wonder if you didn’t cook them quite long enough maybe? I’ll pay close attention next time I make a batch and let you know what I find out. 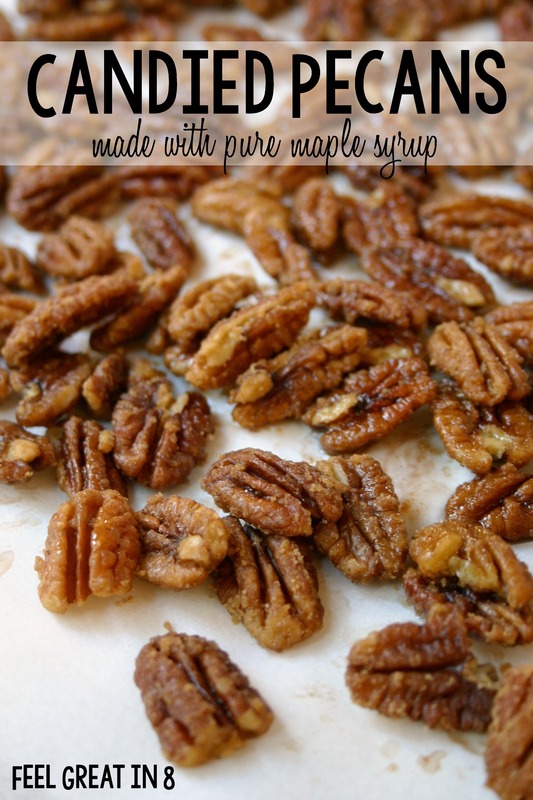 My whole family loved these maple glazed pecans. I followed the recipe exactly. We topped our salad of Gorgonzola, pears, and dried cranberries with these. We also heavily garnished hot fudge sundaes with them. Of course, we ate them plain, too! They are addictive. Thank you for this excellent recipe! I have baked pecans before. Would this turn out ok baked? I’ve never tried baking them, but if you try it please let me know how it goes! 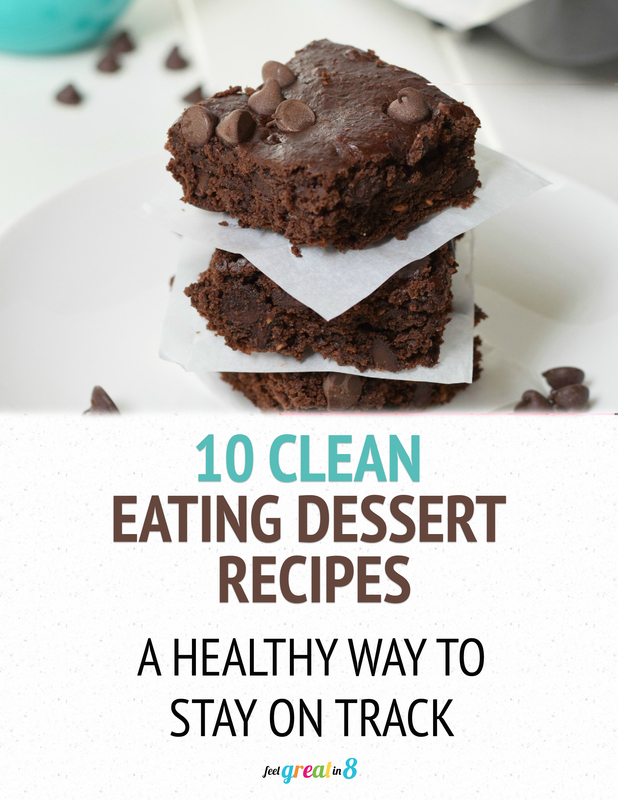 10 Clean Eating Dessert Recipes! !